Claire Phelan of Sea of Change Choir which featured in the semi-final of Ireland’s Got Talent on Virgin Media 1 on Sunday evening. ON Sunday evening Waterford woman, Claire Phelan, was among a special group who set out to win the hearts of the nation in the semi-final of Ireland’s Got Talent, on Virgin Media 1 television. Claire was one of the 46 women in Sea of Change Choir which had received the Golden Buzzer from one of the show’s judges, Denise Van Outen and with it a free pass straight through to the live semi-final heat for their stunning performance of the song “This Is Me” from the Greatest Showman. While they didn’t progress further, their brave dalliance with fame has helped raise awareness of cancer, as Sea of Change is more than just a choir turning heads on the national stage. It’s a collection of women who have either battled cancer or family members of those who have fought that brave fight in recent years. Claire who is daughter of Maura and Michael Phelan, and sister of Tom, an employee of Bausch + Lomb and Helen who resides in Cork, was brought up at St. Ursula’s Terrace before the family moved to Grange Cove, on the Dunmore Road. She told how she was diagnosed by Professor Arnold Hill, Chief Breast Cancer Consultant, at Beaumount Hospital on June 15, 2012 with Stage 3, Grade 2 Invasive Ductal Carcinoma Breast Cancer. She had an 8cm tumour. “I had three months of aggressive chemotherapy (AC chemo) followed by a left mastectomy and auxiliary clearance of 17 lymph nodes of which eight were cancerous, in October 2012. This was then followed by a further three months of Taxol Chemotherapy and after a six week break of recovery time in between I then proceeded to have almost seven weeks of daily Radiation Treatment which took place at St Luke’s Hospital. In all I was doing treatment over a 12 month period,” she said. 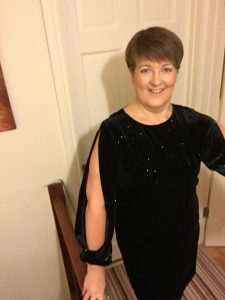 Claire said that cancer changed her life in a positive way and with the choir she is now involved in fundraising largely for Aoibheann’s Pink Tie, an Irish children’s cancer charity. It was actually through a world record breaking challenge for the charity, the Strip and Dip on Meaghermore beach in Wicklow last June, that the seed was set for Sea of Change. From it a group came together in October to enter Ireland’s Got Talent in the hope of highlighting to a national audience that cancer is not necessarily life-limiting and that it is OK to talk about it. After five one-hour rehearsals with musical director, Ian Brabazan, they were on the show bringing the audience and judges to their feet in appreciation of the performance. It was fitting that on Sunday, Mother’s Day, this fantastic choir got to let their talent shine one more time with a stunning performance of Take That’s Greatest Day.